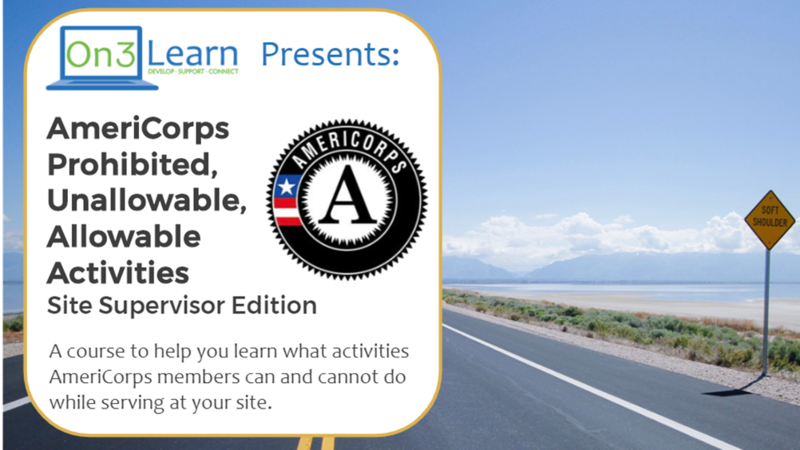 Designed for AmeriCorps Site Supervisors, this course will develop an understanding of prohibited, unallowable, and allowable activities - what they are, their importance, how they show up, and how to identify each type of activity. With that knowledge, AmeriCorps Site Supervisors will be able to train and support their members and train organization staff on prohibited, unallowable, and allowable activities. Know the background and risks related to prohibited and unallowable activities including the background and context of both and what's at stake if you are non-compliant. Understand and identify unallowable and prohibited activities. Communicate with other staff at your organization the role of your AmeriCorps member(s). Understand the important role you play in supporting your member(s) and program. Staff members will receive the following resources as part of taking the course. Downloadable document showing the Prohibited Activities listed from § 2520.65. AmeriCorps site supervisors. This course should be taken by any site supervisors responsible for supervising AmeriCorps members. In addition, each participant also receives a certificate of completion once they’ve successfully finished the course. This can be a great document to demonstrate how the AmeriCorps program is doing its due diligence and providing training to ensure compliance with the prohibited and unallowable activities.